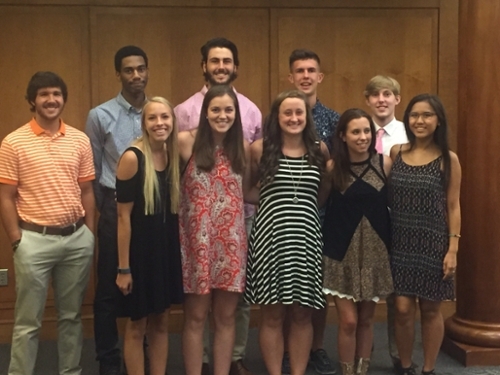 LaGrange’s most prestigious non-academic honor for entering students, LIFT provides a leadership-development program for 10 incoming first-year undergraduates. If you have a strong leadership/service-oriented background, consider taking part in this fun and challenging experience. The intensity of the program's leadership development curriculum begins immediately. Its first stage takes participants to North Carolina Outward Bound's Cedar Rock Base Camp, located near Brevard, North Carolina. This trip includes an intensive four-day backpacking and rock-climbing experience through the Mt. Pisgah National Forest. In preparation for the trip, participants should be able to hike a total of two to three miles in a day at a steady pace as well as being comfortable with being outdoors or extended periods of time. All costs associated with the trip are covered by a generous donation provided by LaGrange College Trustee Ted Beason. A leadership/service résumé. This should include the applicant's name, email address, phone number, mailing address and high school name. The résumé also should include two sections that outline the applicant's leadership and service accomplishments as well as awards, if applicable. The selection committee is looking for candidates who have demonstrated a desire to serve others in their schools, churches and communities. A statement indicating whether the applicant would be able to attend the North Carolina Outward Bound trip. The trip is currently scheduled to occur in the first week of August. Although the trip is an important part of the program, we realize that individuals may have specific needs or circumstances that would not allow them to participate; if you are unable to attend the trip, please explain why in your application. Interested students must apply before Friday, June 14, 2019.